I realize this is mostly a tech blog, but I do have a few personal categories on here, including one for Fitness. For those of you that don’t know me personally, my fitness journey started a few years ago after losing my son Bryan. Last year, I decided to start doing triathlons as a way to stay motivated. I was already running, albeit not very fast. I enjoyed going for runs with my wife outside and I did a few 5k runs, but I was looking for more variety. I’m not sure where the idea came from, but I started looking at triathlons. I decided I was going to sign up for the Chicago Triathlon in 2018. I haven’t swam since I had swimming lessons as a kid and I haven’t ridden a bike in almost as long…I didn’t even own a bike! I started to get excited and I began looking at other local triathlons, and I signed up for the Batavia Triathlon, Lake Zurich Triathlon, and Naperville Triathlon. For Chicago, I originally signed up for the Sprint Distance, but after signing up for the other three sprints, I decided to change Chicago to the Olympic distance. The reason I’m sharing this history is because I didn’t really follow a training plan for those four triathlons I did in 2018. I tried Zwift, TrainerRoad, and The Sufferfest for cycling, but I didn’t have a true plan, especially for swimming and running. I finished all four triathlons, but I was near the end of my age group for almost all of them. I didn’t sign up to compete in them, I did it for personal reasons, so I was really only competing with myself. Seeing the results though was a little discouraging and depressing at times, though I tried not to dwell on them. Each race I got a little better. Welcome to 2019 now. I decided that I wanted to step up the distance to a Half Ironman. My wife got on board with me and we both are signed up for the Half Ironman Muncie 70.3 in July 2019! At the end of 2018, I heard about this training platform called TriDot from some Facebook Groups. I saw that they had a Preseason Project where you could apply and get a couple of free months if you qualified. I submitted my application and was accepted. I’ll share my experience from the beginning and after using the platform for almost six months now. I was also just accepted to be a TriDot Ambassador for 2019 which I’m excited about! Besides being accepted into their free two month Preseason Project, I liked the idea of having workouts customized to my abilities. I purchased a few books like 80/20 Triathlon, IronFit Secrets For Half Iron Distance, and Be Iron Fit. They all had great training plans, but they were all static plans that didn’t change as you trained. With TriDot, the training dynamically changes as you train and complete your assessments. Each week, your training load and zones could change based on pace, HR, etc from previous training sessions and assessments. TriDot uses something called a TrainX score for all of your training sessions. It is important not to get caught up in this score, but I find that it helps hold me accountable to my workouts. It takes into consideration pace (or power) and HR zones, then gives you a score after each workouts based on well you hit your target zones. The first thing that you’ll want to decide is which package is right for you. TriDot offers a variety of packages for every athlete, whether you want to just finish or be competitive in your age group. You can always visit the TriDot Test Drive page for current pricing and a comparison of the different packages. Once you select your package, the next thing to do is to build your Athlete Profile. At first, the platform can seem a little overwhelming because of the amount of data that is needed, so make sure you take your time to watch the intro videos. search the support pages, and click around the site to get comfortable with it. You’ll need to enter things like your age, height, weight, but also some benchmarks for swimming, biking and running. It is important to fill out our athlete profile completely so that the training plan is accurate. Depending on the package you selected, you can also set things like a preferred day off, training loads for swim, bike, or run, and strength training days. Next, you’ll want to add your A race in. TriDot has a large database of races and by adding in your races, you’ll get things like estimated times and PR potential. Their database also accounts for typical weather for that race, elevation, etc. Depending on the package you selected, you can also add multiple races for your season and your training will adapt to those races, but the main focus will be on your A race. It is also a good idea to go under My Connections to link your Garmin, Strava, or Polar accounts to automatically sync workouts. The training schedule can look a little overwhelming at first and there are some weeks when you have no rest days, but TriDot’s algorithm does lower intensity workouts with intervals to prevent injury and it works quite well. During the week, most of my workouts have been around an hour with a longer bike and run on the weekends. For each of your workouts, it is important to set the estimated start time and also check whether it is an Indoor Session or not. These small settings could change your zones based on weather and other factors. You can easily move workouts around within a week to fit your schedule if needed. It is good practice to try to keep the same flow of workouts if possible. You can see the planned time in each zone for your pace/power and HR. Once the workout is complete, it will show your actual time in each zone which will then give you a TrainX score. I’ll go into some details of where I would like to see this going later in this review. 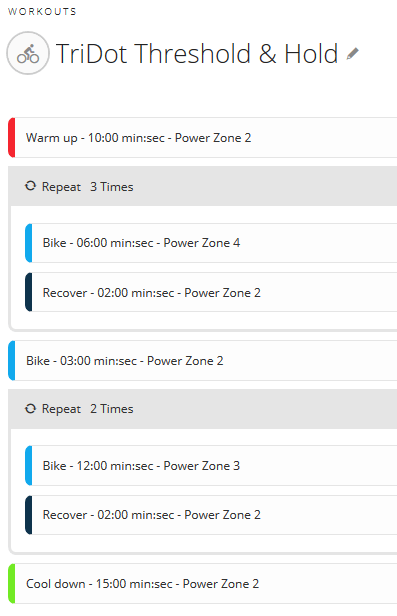 What I typically do is create my workouts in Garmin Connect for the bike and run workouts. From there, I can sync those with my Garmin Forerunner 935 and my Garmin Edge 520+. You can configure your repeats, duration and your target pace or power zones. If you have a smart trainer for your bike and a Garmin Edge, you can use your Edge to control the resistance of your trainer. I found this to work quite well. I no longer pay for a cycling app like Zwift. Instead, I listen to music or watch TV while biking and let the Edge control my trainer. During a run, your watch will show the pace or HR zone with a meter to show if you’re where you’re supposed to be and it’ll alert you when you get out of your target zone. TriDot offers a mobile app for Android and iPhone devices. The app is fairly simple and straightforward. It basically offers you a view of your training schedule. You can click into each workout to view the zone details, set your estimated start time and whether it is an indoor session. You can also manually complete the workout from the mobile app if you’re not planning on syncing it from another platform. You can also move workouts around using the mobile app if you need to reschedule them. There’s only a few things I would like to see in TriDot. I would like to see the mobile app developed a little more. Having the training workouts available is great, but I would like to be able to see my race predictions and enter my assessment numbers from the mobile app without needing to log onto the website. The only other improvement I would like to see would be a way to get the workouts into my Garmin devices without needing to create them manually. 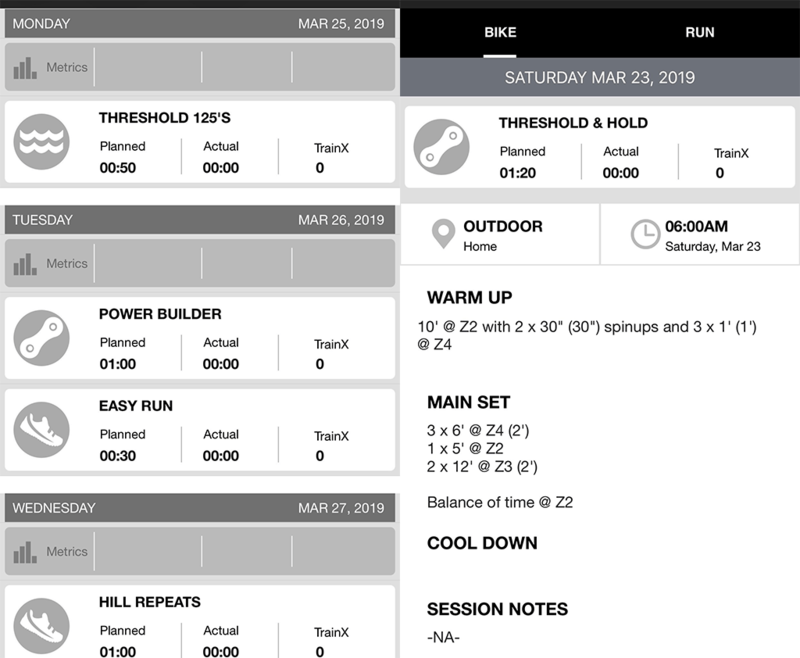 Once you use TriDot for a few months, you’ll have the basics for most workouts created and just need to tweak them each week. If TriDot could create a Garmin Connect IQ app that would pull the workout dynamically, that would be a real time saver. Overall, I’m extremely satisfied with the platform and I’m seeing results. I would easily recommend the TriDot platform to anyone in the triathlon sport. There is a pricing option available for everyone. I don’t dwell on my TrainX scores, but I like having the accountability of knowing I did a workout how I was supposed to. If you’re interested in using TriDot and have any questions, feel free to leave a comment below. Or if you have any feedback on the platform or my review, comment below.